After an eight-hour work in microgravity, Dextre and the Canadarm turn out to be the first self-repairing mechanical robotic system in space, changing a damaged camera without exiting orbit or depending on pesky cosmonauts. Dextre, The Canadarm, and mobile base stations work all together as a robotic structure devoted to the International Space Station (ISS). Dextre, the arm's independent robotic big hand, was pulled and placed into location by the Canadarm to carefully change a damaged video camera on the arm's elbow. One of the cameras at the arm's elbow-joint has been generating unclear images. It's still useable, just not perfect. 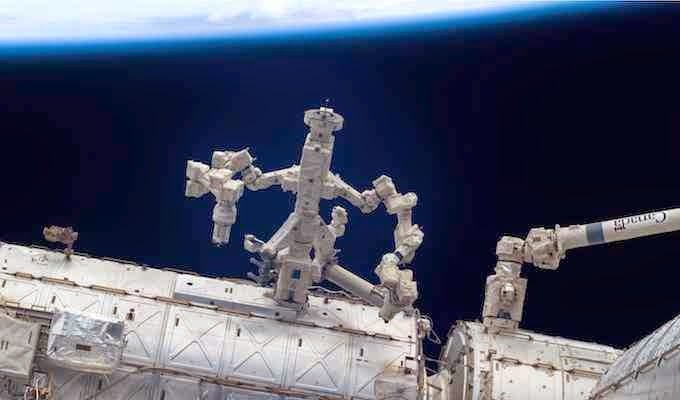 So in an eight-hour, Dextre swapped it to a less-critical place at the mobile base. Tuesday, it will recover a new camera from the airlock, and connect it as a replacement. The Mobile Serving System has 11 cameras. Two cameras are postioned on the Canadarm elbow, five on Dextre, and one on each mobile base station. Pulling the damaged camera out of position required unlocking it, then a limited watchful pulls and the unavoidable twist. The space dance then continued with the Canadarm doing dips and spins to relocate Dextre to attach the damaged-but-functional camera at the mobile base station.